Zoosk.com is one of the most popular dating sites, particularly among young people. It is relatively new – in fact, it started as a Facebook application several years ago. Right now, it functions as something in between a typical dating platform and a social networking site, which greatly explains its popularity among the generation of young Internet users. Plus, www.zoosk.com has spread its influence to at least 25 countries of the world (in fact, might be even more, but the site is currently available in 25 languages). One of the reasons for the popularity of zoosk.com dating site is that it can easily be integrated with Facebook and other social platforms, so the amount of profile information you have to fill in is minimal – just a couple of lines about what you are looking for. And that’s it – you can start dating! www.zoosk.com dating online is different from habitual online dating. As it was already mentioned, it functions as a social networking site, where the element of game and casual communication plays one of the most important parts. To begin with, you do not pay for membership in the traditional way – you use coins, which can be either purchased (the usual way – PayPal, credit card, check), or earned through positive answers in a game of matching Carousel, answering relevant questions, linking your Facebook profile to a mobile zoosk.com app, etc. We will discuss these means in greater detail later in this zoosk.com review. The Carousel game is, perhaps, one of the most important aspects that make www.zoosk.com different from other dating platforms. Despite the fact that the essence is not at all unprecedented– you receive a new match suggestion each day, making the whole thing look like a game makes it more fun. After you are given your Carousel match suggestion, you should state your interest by saying “yes”, “no”, or “maybe”. We mentioned before that a positive answer, that is – “yes”, will bring you some free coins. Yet, do not be too greedy to say “yes” to anybody –your answers are being calculated and you will receive further matches suggestions based on your former responses. Zoosk.com calls this system Behavioral Matchmaking ™, and, if you link your dating account to your Facebook profile, it will take into the account your Facebook behavior as well. In theory, this should be more than enough to offer you some relevant suggestions. www.zoosk.com allows you to see other members’ profiles either one by one or in a list. You can contact (and be contacted by others) with a wink, which is free, or with a message, which requires coins. When it comes to searching criteria, zoosk.com has a pretty basic system – you can indicate age group you are interested in and a radius of your potential’s partner’s residence. That’s it – no more other options. And, yes, in comparison with other dating sites the choice sees pretty scarce, but this simplicity is what makes zoosk.com so popular. And, finally, you do not have to earn coins slowly – you can buy them at once. The price starts at 5$ for 50 coins. When it comes to the actual membership fees, the price per month will be about 30$ (29.95, to be exact). And, not surprisingly, if you subscribe for a longer term, the price will start to gradually diminish: three months will cost you 19.98 $ per month, and half a year – just 12.48$ per month. And yes – it is also possible to live on free coins. In theory. In reality, however, it is going to be not that user-friendly. 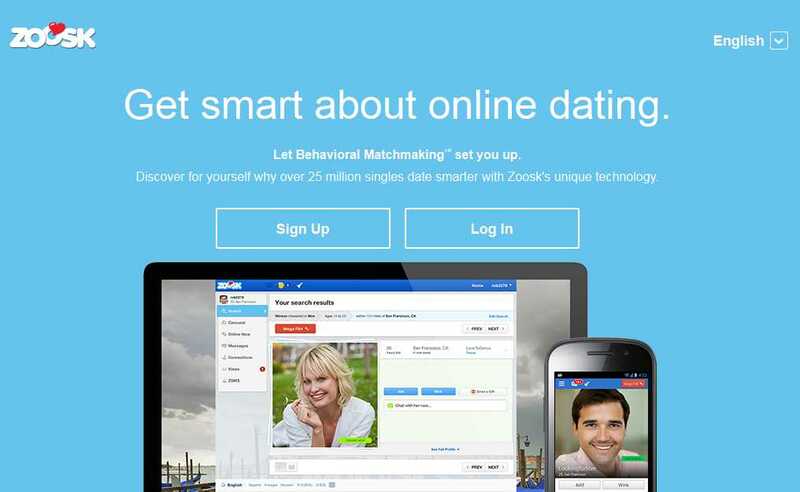 Either positive, or negative, any zoosk.com review will mention that the site is simple to use and does not require filling in long forms and applications. In our opinion, this is one of its most obvious and most important advantages. After all, online dating has become so increasingly popular because we simply have no time to sort out most of our potential partners on face-to-face dates. So, the fact that it saves you time is already impressing enough. Plus, its Behavioral Matchmaking ™ system, especially if linked to Facebook account, can work much better than any other date-making scheme based on your responses (we all try to look better than we actually are at times, right?). It will be difficult to argue that our Facebook profiles already say a lot about us and the way we communicate on Facebook says even more than that. Frankly speaking, if betting on a traditional question/answer matchmaking system versus the analysis of one’s Facebook activity, we’d bet on Facebook. In other words, www.zoosk.com wins. In our opinion, anyway. Apart from Facebook integration and simple system, zoosk.com offers its users a handy mobile app, which can make casual communication between different users even easier. The application is popular both with iOS and Android users. In fact, according to Google play, www.zoosk.com is one of the most popular dating applications for Android, and a total of 30% of zoosk.com users access their profiles from mobile phones. And, of course, there is an impressive amount of users and available languages. It already has 50 million users and 25 different languages, so its spread is pretty impressive. And even though their search might not be very detailed, it is still highly possible to get a lot of relevant hits in your vicinity – just don’t forget to mention the radius. Finally, www.zoosk.com is relatively cheap in comparison with other dating platforms and its generous reward system gives you a chance to earn some coins for free! To sum it up, zoosk.com is a very casual, simple site that functions more like a social network rather than a traditional online dating platform. It is hard to tell whether you are going to meet your soul mate on the site, but there is one thing you can stay assured of – you will definitely have some fun! It is true that many users never go beyond the wink, yet it is also true that many of them collect/purchase coins to explore other horizons. To be completely honest, your success will mostly depend on your motivation and persistence – just like with any other dating site.